Network Cloud Services provides for building and managing secure private networks over the internet by utilizing global cloud computing infrastructure. 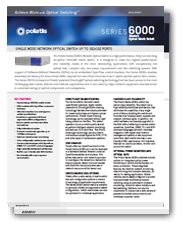 Polatis switches allow for more productive use of valuable network resources in the Cloud. As cloud computing transforms IT infrastructure and makes it possible for any size business to adopt and afford enterprise-class apps, computing and storage without the cost, complexity, and constraints of traditional networks Polatis switches lead the industry and at a lower cost. 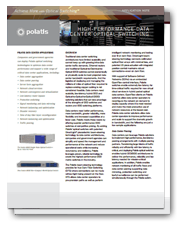 Data center operators concerned with key categories within cloud networking like Cloud-Enabled Networking (CEN) and Cloud-Based Networking (CBN) rely upon world-class service and support of Polatis optical switches.